This piece was one of the first published by the artist and game designer Tom Wham, who joined TSR is 1977. It first appeared in the 6th printing of the original 'White Box' edition of Dungeons & Dragons, replacing the section of text that in previous printings had described the Balrog--excised due to legal pressure from the Tolkien estate. It also appeared on the front page of the 1979 bluish 'wizard logo' Character Record Sheets. Here they all are--the Fighter with his sentient magic sword, the conical-capped Magic-User hiding behind him, the Thief in the process of picking the Magic-User's pocket and the beneficent Cleric (is he trying to gently dissuade the Thief or naively oblivious to his action?). To me, they are united in having an almost maniacal look about them, as if to say, this is what the lure of treasure does to everyone. ...Tom Wham's picture is an adventuring party seen from the outside, from the perspective of the gamer looking in. Because let's face it, most of our gaming sessions have plenty of Tom-Wham-adventurer moments in them. Quoting Monty Python? That's the Tom Wham guys. Dancing around the table when your roll for dexterity comes up triple 6's? That's the Tom Wham guys. 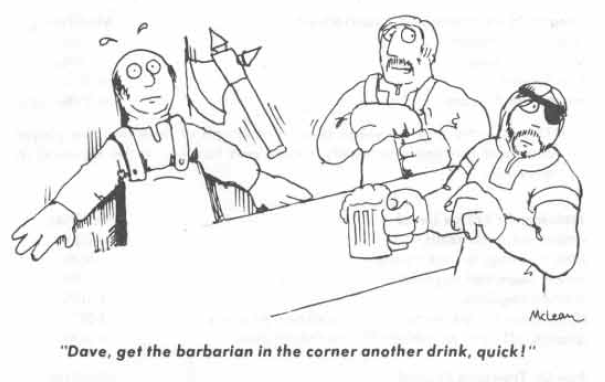 There are no cartoons in 2nd edition AD&D. Recently Jon Peterson unearthed and published a sort of variant or possibly even proto-version of Dungeons & Dragons, played in Minneapolis in 1974. Among other things it featured giant carnivorous meatballs. 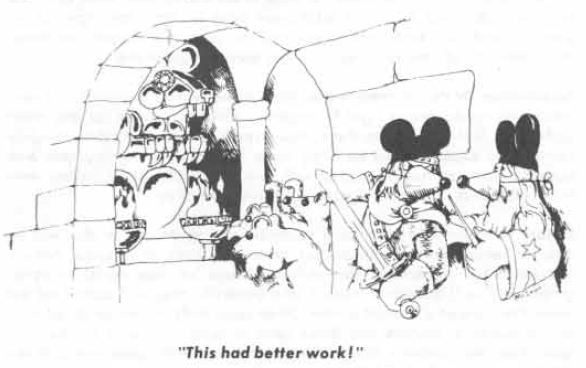 I think many of us would agree that 'official' OD&D was wise not to go that far, though if you wanted more of that sort of thing, there was always Tunnels & Trolls. However, in the Golden Age of the game, there was a sense (at least at some level) that things shouldn't be taken that seriously, partly because we all were well familiar with how the game was actually played. Despite some of the fantastical depictions in the media--like Tom Hanks and friends sitting around a spooky table that featured candles and crystals--we all knew that in the end we are all just a bunch of pimply kids getting potato chip grease on our graph paper and riffing about Monty Python or Doctor Who in between rolls. The game was cool. No question about it. But what was wrong with laughing with it and at it from time to time, as well as (on occasion at least) laughing at ourselves? *2e was still old school in many ways, and to be fair, I liked much of the art in 2e, but on some things the vibe had already changed. **Unless you say some of the names aloud to your wife. For the list of over 800 prestige classes I published a few weeks back (stolen from Wikipedia), I stuck a few phony names into it--such as inserting 'Swiss Burger with Bacon' in between 'Swift Wing' and 'Sword Dancer'--to see whether anyone was paying attention. My wife, at least, thinks I'm a funny man. Great post. I think that the social aspect of playing was almost something new as a teenager, interacting with my peers at a level (no pun intended) that hadn't occurred until D&D arrived, so the humour side of the whole experience was integral to how well the game worked, greasing the wheels as it were, especially at the age we were. Oh yeah, the art of Will McLean. All that time, I thought the top-most pic was my McLean (it almost looks like the Cleric wants his share of the take LOL). 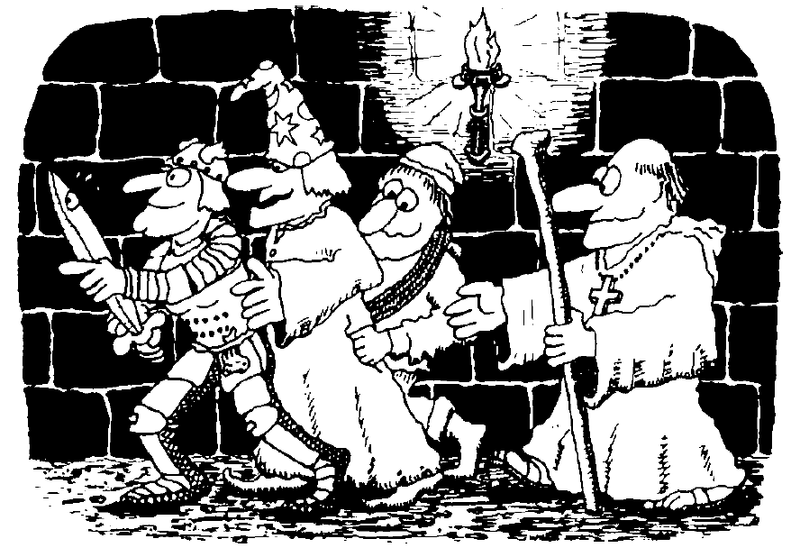 You can find more of McLean's D&D-based comics by finding the game manuals for the first two or three games of Wizardry -- they are old video games. I think I seen his comics in other places as well. To be fair, I seen some silliness in the 2nd edition years, but they where mostly tongue-and-cheek articles of Dragon Magazine. They where some funny articles, but they where never the core fixtures of the game, and where never meant to be played in a normal game. The closest thing to silly in 2e was that one cowardly Gnome who was trying to avoid entering a dungeon, but the Fighter was like "Hay, where are you going? We got some spelunking to do!" Yeah, any silly picture would have contrasted with all the serious, photo-realistic poses from that era. Great stuff! I need to finally read Gamma World and Mutant Future. In truth, I thought the art of 2e was interesting though quite varied. You had those subdued blue woodcut designs (unique to 2e and perhaps a few modules, I think) and then on the next page a 'realistic' color painting featuring a female fighter wearing a cloth bikini (not even a chainmail bikini). Sexism aside, I thought some of the paintings were cool but some were oddly drab and depressing.